Nadia over at A Bookish Way of Life tagged me as a Kreativ Blogger. To accept this lovely, gracious tag, I am supposed to list 7 random things about me. 2. I am always worried that someone is going to be ahead of me in line. 3. I don’t like exclamation points. 4. I don’t want my cremated remains to be sprinkled in the “South” so I specified in my will that they be sprinkled in a state or territory that fought on the side of the Union in the Civil War. 5. When I think about time travel, I always think about going backward. 6. I would like to be a weekend guest at Martha Stewart’s house, but I know I would probably have a better time at Ina Garten’s. 7. I wish I was in a choir that never performed. Why can’t we just practice? Your posts are so enjoyable, Thomas (sans exclamation point). But I really wanted to use one . . . I see you have a great start on your 100+ books this year, too. I am so with you about the choir! When I used to be in choir, I loved going to practice and dreaded performances. The church choir, actually, was good for this, because it never felt like a performance. Love these answers :-) I had friends over this weekend and they had never seen Room with a view. So I'm hosting a viewing soon for them as I own the dvd, it's a neccesity for everyone. Funny story I read about being a houseguest for Martha Stewart. Apparently her guestrooms all have little 'lists' of things NOT to do (oh brother). One of the rules was to not leave windows open when not in the room incase it rained. The author did just this and when he returned, it had rained! The polished wood floors were SOPPING wet. He went and grabbed as many white fluffy towels as he could find and the polish from the floor stained them all BROWN. nightmare at marthas! He was never invited back of course. I sadly overuse the exclamation point and just went through this comment and deleted as many as I could. Good to know. I agree. You'd have a better time at Ina's. She always has fab appetizers and cocktails. She NEVER forgets the cocktails. I would definitely go back in time, too! Going forward is a bit scary, so I'd rather just wait and see how it unfolds – the past holds no surprises. And I am in complete agreement with you regarding Ina. She rocks! I love her show – she always seems to be having a good time. “How good is that?” And I love how she incorporates her friends on her shows, especially TR – he is so handsome! Great post! Love reading bits about you. Denise: My reading for the year is lagging quite a bit over last year. Or at least it feels like it. Still plenty of time to catch up. Bibliotrist: It is odd I never think of myself interacting with the past. Just invisibly observing. Jenny: I also like the varied rep that one sings in a church choir vs a performing choir. I've sung in many a church choir, but these days I can't imagine giving up my Sunday mornings again. 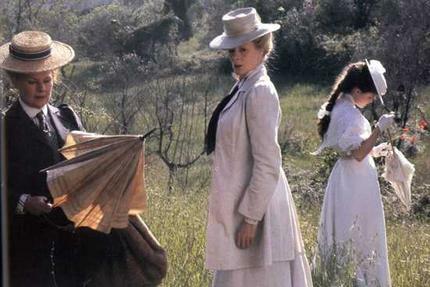 Stefanie: It is hard not to use exclamation points when writing about Merchant-Ivory. Ti: I think Martha's world and personality are far more fascinating, but the overall experience wouldn't be very relaxing. Whereas Ina always seems relaxed. Nadia: Actually I think the past would have lots of surprises. At least little ones. All the big things are known but what about all the unknowns? Wholeheartedly agree about #1. I recommend repeat viewings of Gosford Park, which features a long, gloriously bitchy tea-drinking scene. Re # 6: Just imagine the pressure at Martha's! (Sorry, but the exclamation point conveyed just the right amount of horror.) Definitely Ina's. Bookish NYC: All of the Altman cross-talk in Gosford Park makes it hard for me to fully enjoy that film. I feel like I miss too much dialog. These are great tidbits you have shared! I love the bit about time travel…I so agree. I would much rather go back in time (maybe comes from me studying history in college?) than forward! What wonderful random facts, Thomas, I enjoyed that. Kathleen: I studied history in college as well. And I guess it is no surprise that I would most like to go back late Victorian/early Edwardian England since I wrote my senior paper on Sir Edward Elgar. Simon T: I actually cut this list of random facts from a similar list of 25 I did on Facebook many months ago. The longer list on FB was slightly more revealing and embarassing. This is one of my favorite movies of all times – so swoonworthy! When I was young I watched it over and over…on a bad videotape. Tara: I had a bad copy of it myself. It got to the point where the audio wasn't in sync with the video.